I've made no secret of my desire to have a cafe of my own one day and never mind the fact that I've spent the last week trying to learn how to pull a good shot of espresso (more on that adventure later). The fact is, I absolutely love it when others are pulling the shots and have set up a beautiful space to hand out and enjoy my latte. So after hearing word about Cafe at 407 from blog readers and good friends, I had to check it out. Cafe at 407 is a truly a cafe with a purpose. It is a place that instantly radiates welcome and the furniture, decor, and people all seem to quietly beckon, "come in and stay awhile". Located in the village of Liverpool, this warm, comforting spot is worth checking out. This is a cafe with a purpose--it supports Ophelia's Place, a program that assists people with disordered eating and body issues. While you'll find lots of resources on these topics on display in one section of the cafe and otherwise casually stewn among other reading material, and lots of uplifting messages written on the walls, make no mistake, this is a place to get some really good food and a decent latte. On the day I met my sister friends for lunch I enjoyed a delicious chicken salad sandwich/black bean soup combo. Other menu items such as their salads and the veggie sandwich (garlic hummus, spinach, and provolone) made choosing difficult. And of course I loved the complementary biscotti. The food was nicely done and on that chilly afternoon, I could have easily hung out there for hours--sitting in the comfy chairs, chatting up Mary Ellen, the owner, and doing some writing. Check out more information about Cafe at 407 and then go, get some good food, and stay awhile. Cafe at 407, 407 Tulip Street, Liverpool, NY. Closed Sunday and Monday. Ever have an encounter that makes your heart leap with joy? That happened to me today after spending just a few minutes with the owners of Freedom of Espresso. I've got to go back and do a full interview and such but there were two things that made me so happy that I had to post about it now. The first is their green tea coffee--that's right: GREEN TEA COFFEE. I had a taste of it this morning and it is fantastic--a Freedom of Espresso exclusive. Now my conflict over drinking green tea or coffee in the morning is over! The other thing that made me happy is their new cafe over in Franklin Square. It opened while I was in the throes of Holy Week back in early April. It is a beautiful spot over on the corner of Solar and Plum in the Lofts at Franklin Square. I'm having major fantasies about getting up early in the morning, going for a run along the Creekwalk to the Inner Harbor and running back to Freedom of Espresso for coffee and a read of the paper--I can't wait!!! In other cafe news, Pascale's Bakehouse is moving--right now--from its location in the Hawley-Green to the Hotel Syracuse downtown. This is great news for downtown and still great news for those in Hawley-Green. Word on the street is that a bistro is planning to open in Pascale's old digs so watch for that in the coming months. After I return from vacation in early June (we're off to the Bahamas and I won't be posting much beginning Monday) I'll be posting in earnest about other places that are getting me hooked back on coffee--like the Kind Coffee Company on West Fayette and the radical roaster guy who will deliver freshly roasted beans to your front door. Stay tuned. Does the Salt City have a cafe scene? I dare say it does. This post is part of a series on my adventures into Cafe Society--Syracuse style. Apparently, I need to take more breaks for formal tea. I mean, a cup of Jamine tea to start the day and a cup of Lapsong Souchang to end it are fine but there's nothing like sitting down to the whole deal with scones, cucumber finger sandwiches and chocolate covered strawberries. The White Dove Tea Room is a place I've visited before but today I thought, "I've really got to make this a habit." The White Dove is located in Syracuse's Little Italy on North Salina Street. It is a small and intimate tea room--the best kind, really--just about 24 seats. The owner, Suzanne, breezes around the room and greets folks like their family. I got the sense that this place is about more than the tea--its about community, great food and lots of love. 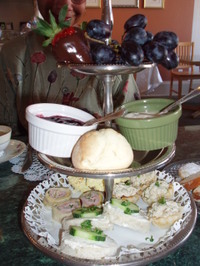 Our tea today was not quite a formal tea--which is the full linen, silver, and more food than you can imagine. We just had the more food deal. Working from the bottom up our feast included open face cucumber finger sandwiches, open face egg salad on wheat bread--was that a smoky Spanish paprika that gave it a little kick? Light as air scones, still warm from the oven, were served with raspberry jam and Devonshire clotted cream. Grapes and chocolate-covered strawberries donned the top tier and then there was still a dessert plate! Let's just say goodie bags were taken home. Ah, but this is a tea room so let's talk tea, shall we? Actually, there isn't much to say, I had a very nice Palm Court tea--a black leaf tea that took well to cream and sugar. 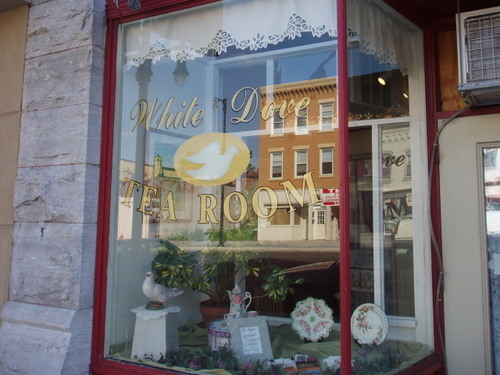 One of the nice touches about White Dove is that instead of leaving the pot on the table to over steep and, perhaps, grow cold, a server very attentively took to refreshing our cups with hot, fresh tea before our cups ever emptied. Need another reason to love them? They pour Harney and Sons tea! Then you've got to check out their new monthly seven-course dinners. 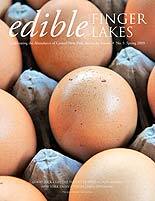 Once a month they take reservations for a set menu that features local ingredients and inspired cooking. The June dinner features Flowered Prawn bathed in Miso, Roasted Pork Chop with Cornmeal Pancakes and Granny Smith Apple Butter, Whipped Brie and Slow Roasted Red and Yellow Beets, and Port Poached Pear Salad. The bad news: The June 7 dinner is sold out. The Good news: if you call White Dove and get on their email list they will email you the menu of the next dinner and you can reserve your spot early. This feast costs $70 per person and is bring you own wine--a great chance to do your own pairings and drink what you really want. So whether you want a nice afternoon of tea and scones or an evening of fine dining the White Dove Tea Room is the place to be.